Toast to the Peabody Wins for Killing Eve, Nanette, and MoreAnd one for Steven Universe. What’s It Like Writing for The Good Place?On this week’s Good One podcast, we broadcast The Good Place writers panel from Vulture Festival L.A.
Mike Schur Signs Long-term Deal With NBC, Maybe This Is the Good Place?Holy forking shirtballs. Which Ex-Socialite Said This Out-of-Touch Quote: Alexis Rose or Tahani Al-Jamil?They have a lot of famous friends. You’ll Need Great Vision to Spot The Good Place Showrunner’s Favorite Easter EggDid you catch it? Why Do I Feel So Conflicted About Chidi and Eleanor on The Good Place?Chidi and Eleanor’s relationship doesn’t always feel natural, yet I’m still rooting for this sitcom couple to end up together. Every Single Celebrity That Tahani Has Name-Dropped on The Good PlaceWhen Princess Diana is your godmother and Beyoncé is your best friend, can you blame a girl for bragging? The Good Place Season Finale Recap: Memories You May Have ForgottenThe show ends the season by hitting yet another reset button, to diminishing returns. Every Parks and Recreation Crossover in The Good PlaceLi’l Sebastian and Paunch Burger, they live! The Good Place Recap: The Neighborhood PlayA busy episode brings the gang back to where they began — sort of — in a last-ditch bid to change how modern humanity is judged. D’Arcy Carden Lost Her Mind Prepping for Her Standout Good Place EpisodeHer very special Janet episode came at a great cost. The Good Place Recap: 4 Oreos from ParadiseEven in the Good Place — or at least its mail room — nothing’s as easy as it seems. What The Good Place Teaches Us About Politics“The Book of Dougs” makes a sly political point, but it’s not made in blatantly political terms. Holy Fork: The Good Place’s First Look at the Actual Good PlaceIt smells like … chlorine? 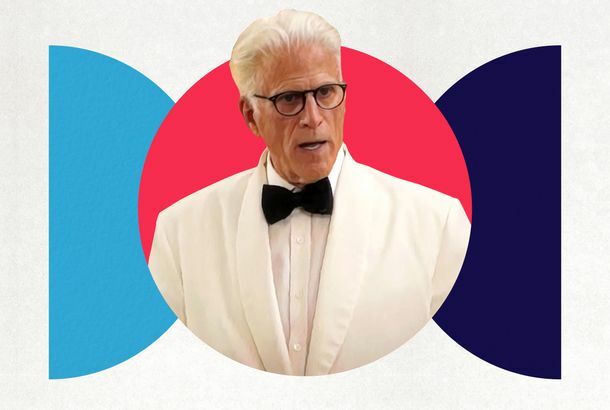 Enjoy This Supercut of Ted Danson’s Good Place Reassuring Arm PatsHappy Birthday, Mr. Architect! The Best Hidden Jokes and Easter Eggs in The Good Place Season 3Prepare yourself for a tremendous number of puns. The Good Place Recap: Void (Where Prohibited)“Janet(s)” is a clear dividing line in the history of The Good Place. How The Good Place Made Its Very Special Janet EpisodeAnd that Janet-on-Janet kissing scene. The Good Place Renewed for Season 4, You Little Chili BabiesMaybe the Jaguars can finally win the Super Bowl. The Good Place Has Very Specific Rules About How the Bad Place WorksNo to torturing kids, yes to toxic masculinity demons. How The Good Place Came Up With Its ‘Jeremy Bearimy’ Joke“It’s a bit of a middle finger,” says showrunner Mike Schur. Ted Danson Is So Nice, He’ll Call You Just to Say How Much He Enjoyed Work TodayAs Mike Schur explained, sometimes his Good Place star will phone him just to say thanks. Michael McKean on His Good Place Cameo for the AgesThe comedy legend breaks down his surprise appearance as the mysterious Canadian stoner Doug Forcett. Ted Danson’s Floss Dancing On The Good Place Set Is Internet NirvanaIs he a better flosser than William Jackson Harper? The Good Place Recap: True NorthThe arrival of a pivotal character marks a standout episode that also features one of the most entertaining sequences of the entire series. Holy Fork, Did You Spot Li’l Sebastian on The Good Place?The Parks and Recreation icon paid an afterlife visit to Michael’s neighborhood. The Good Place’s Lizard Is a ‘Moody’ Improv MasterMuch to the delight of Kristen Bell. The Good Place Recap: If You Choose Not to Decide …Just as the show seems to be edging further backward into familiar territory, it makes a welcome leap forward into the unpredictable. The Good Place Recap: The Parent TrapA transatlantic pairing of family reunions retreads familiar ground, but unearths some genuinely moving moments in the process. The Good Place Isn’t About Heaven and Hell, It’s About the InternetThis sitcom proves that TV can still bring people together in the streaming age. The Good Place Recap: Daddy and ThemWe learn the secret of Donkey Doug in an episode that takes part of the gang to Florida while those left behind ponder breakup ethics. Is Chidi Too Swole on The Good Place?Am I complaining about this? No, but I do have questions. The Good Place Recap: Give It Away NowA metaphysical revelation throws the group into an existential crisis (and for one, that means making weird chili). Wait, Do The Good Place and Parks and Recreation Exist in a Shared Universe?Pawnee’s famous Paunch Burger makes it to Australia! The Good Place Recap: The Butterfly Shrimp EffectTrevor tries to sow discord and finds the show’s central foursome all-too-easy pickings. Manny Jacinto and Manny Jacinto’s Jawline Join Top Gun SequelThis movie’s got a need, a need for that face. 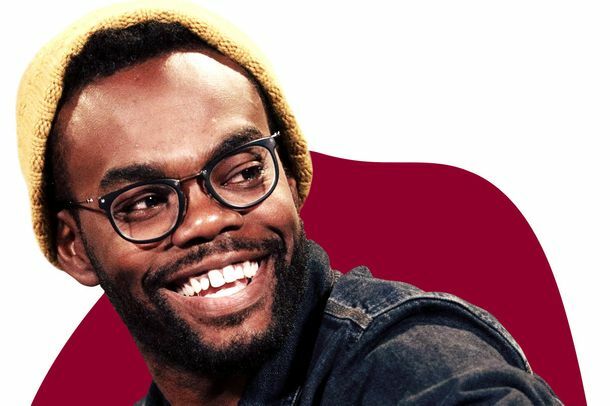 The Good Place Explains Why Chidi Speaks English With an American AccentThe show finally answered a small mystery in its season three premiere. Why The Good Place Keeps Rebooting ItselfThe show is its own philosophical thought experiment. And that’s why it’s so great.